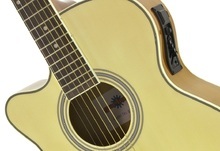 Left-handed are honored this week at Takamine’s who releases four new guitars and a bass from the G Series. Yamaha celebrates at Musikmesse 2014 the 40th anniversary of its L series of acoustic guitars with no less than 22 new models. Lâg Guitars launched this week at NAMM 2014 the brand-new T77PE guitar in the U.S.